President Dwight D. Eisenhower created the Arctic National Wildlife Range in 1960. Seven years later, the discovery of oil just west at Prudhoe Bay began the conflict between oil and wilderness on the North Slope of Alaska. In 1980, President Jimmy Carter signed legislation that doubled the size of the wildlife range, conferred on it wilderness status, and renamed the area the Arctic National Wildlife Refuge (ANWR). In doing so, he set aside 1.5 million acres of coastal plain for possible oil exploration pending further study. And in 1987, the Department of the Interior recommended full-scale oil development on this so-called 1002 area of ANWR. Since then, the question of whether or not to open ANWR to drilling has come before Congress again and again. On March 19, the Senate voted 52 to 48 to keep the provision to open ANWR out of the fiscal year 2004 budget resolution. And the issue is coming up in both chambers as each crafts an energy bill. On April 17, the House passed its version, including a provision to allow limited development of ANWR. The U.S. Geological Survey (USGS) estimates that ANWRs 1002 area holds between 4.3 and 11.8 billion barrels of technically recoverable oil. With the Bush administration priority to reduce dependence on foreign oil, ANWR is sure to be a topic in continuing debates. 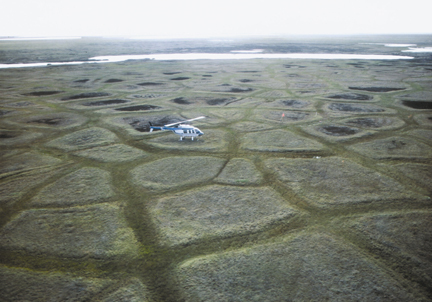 In the winter, the ground on Alaskas North Slope cracks like mud cracks on drying lakes. Over time, the polygon-shaped crack pattern gets wider and deeper, with every crack becoming the point of a big wedge of ice. A roadway, heated building or pipeline that melts the underlying permafrost could become unsupported in a free span across the melting ice wedges, as discussed in a recent report by the National Research Council about environmental effects of oil drilling on the North Slope. Photo by George Gryc. Read the report online. A report released by the National Research Council (NRC) in March is likely to help both sides make a case for or against oil development in ANWR. About the cumulative effects of 30 years of oil and gas drilling along the North Slope, the report cites case after case of negative impacts of development  everything from how the extensive network of roads has harmed the tundra and associated wildlife to how noise has displaced migrations of bowhead whales, forcing subsistence farmers farther out to sea. At the same time, however, the report noted that industry has made great improvements in using technology to reduce environmental effects, and that development has not adversely affected air or water quality. When the report first came out, we were concerned about what it might say, says a Republican Senate staff member. But, taken in its entirety, the Congressionally commissioned report shines a positive light on potential drilling in ANWR, he says. Caribou numbers are through the roof. Despite 30 years of production on the North Slope, theres been no significant impact to air or water, or to the tundra as a result of spills, the staffer says. Although the report itself does not address ANWR, it does say that oil exploration involves unavoidable environmental impacts. Whether the benefits derived from oil and gas activities justify the acceptance of the inevitable accumulated undesirable effects that have accompanied and will accompany them is an issue for society as a whole to debate and judge, the report says. The effects on the North Slope are perhaps most dramatic because the area was largely untouched as recently as 60 years ago. Retired geologist George Gryc of USGS, who served on the NRC committee, remembers landing on a gravel bar on the Colville River in 1944 to a largely uninhabited wilderness. Part of the first, naval exploration of the North Slopes oil potential, Gryc led the way to the first oil drilling a year later and the eventual designation of the area years later as the National Petroleum Reserve Area (NPRA), on the slopes western end. Air strips and roads now service the remote Arctic area, with buildings, well pads and pipelines all dotting the landscape. Those changes have been pretty startling for someone who saw it when it was nothing but wild area, Gryc says. The NRC committee, he says, was surprised by the amount of infrastructure widely spread across the region and by some of the subtle consequences of that infrastructure on the environment. Committee member Art Lachenbruch of the USGS says that the regions unique permafrost imposes some considerable constraints on human activity. Permafrost underlies the whole notion of development in the North Slope, he says. The ground below Prudhoe Bay is permanently frozen down to between 1,000 and 2,000 feet. Vegetation cannot permeate below an active layer of a few feet, which melts during the summer and controls the thermodynamics of the fragile tundra. In general, whenever you disturb the nature of plant cover, you create a thermal disturbance, Lachenbruch says. The plants themselves insulate the permafrost from heat. To adapt, industry has built almost everything on gravel pads about 6 feet high to protect the permafrost. When you want to drill a hole for oil, you put down a big pad, maybe an acre or so, maybe two or three, and itll be 6 feet thick so that people can drive Cats around over the tundra and it will still be stable, he says. That way the tundra underneath will not thaw in the summer. Such modern engineering methods, Lachenbruch says, are largely effective in preventing summer thawing, but create a host of other considerations. Building a gravel-based infrastructure requires thousands of cubic yards of local gravel, for example. The removal of gravel from a river bed might disrupt the beds natural ecosystem. Also, the permafrost necessitates elevated pipelines, which, combined with the road network, create a conspicuous visual impact, he says. Early roads on the North Slope failed because with a gravel thickness of only 3 feet, they could not prevent permafrost melting. The roads became impassable even by foot, and destroyed the insulating capacity of the active layer. Industry has made great engineering and environmental strides since then. They [industry] went through a learning curve like everyone does who comes into a brand new area, Gryc says. Judy Brady of the Alaska Oil and Gas Association says that technology and the environmental sciences have grown together, so that you can have development without irreparable damage. The changes come mostly from using 3-D seismic exploration techniques and directional drilling, which has increased production from a single well with multiple underground openings. Weve gone from 65 acres for 25 to 30 well pads to 13 acres for 54. Thats double the number of wells on half the acreage, she says. Future development scenarios show that exploration will now head into NPRA, where USGS recently re-evaluated the resource, which jumped to a mean estimate of 9.3 billion barrels of technically recoverable oil on federally owned lands. Now that theyve made that discovery, they will progress on into NPRA to the West, particularly along whats called the Barrow trend. The question is how far south and into the reserve they will find this kind of deposit, Gryc says. The other big development is the emphasis on natural gas, he says. The building of a gas pipeline could also increase the footprint of oil and gas exploration on the North Slope, now estimated to be 27 square miles. Such a pipeline is currently under consideration in energy legislation. Similar development trends observed in Prudhoe Bay will follow with new discoveries, Gryc says. Deciding whether or not to develop new areas, such as ANWR, will always be a trade-off. But, Gryc says, by and large, good engineering design is good environmentally. Still, no matter how careful you are, if you go into an untouched area, theres nothing you can do to prevent impact other than to stay out completely. Read the NRC report online.